General Motors' Chevrolet brand will unveil its Spark minicar at the Geneva auto show in March. The five-door car, which will replace the Matiz, goes on sale in Europe in early 2010. 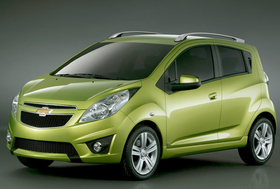 In some European markets Chevrolet already uses the name Spark for the car. Originally seen as the Chevrolet Beat concept in 2007, a near-production concept version of the Spark was shown at the Detroit auto show on Sunday. The 40 miles per gallon car is part of GM's moves is making to remodel itself as an innovative carmaker that produces cars that people want. As the US enters a recession, sales of smaller cars are also expected to increase at the expense of larger cars. GM said the Spark would provide versatility with a fresh, youthful exterior and interior design that is reflected in the selection of materials and colors. The Spark will be built at Chevrolet's Changwon factory in South Korea. At the Detroit show, Troy Clarke, president of GM North America, announced that the Chevrolet Orlando concept vehicle shown at the Paris Motor Show in September 2008 would go into production in 2010. The seven seater medium minivan will be on offer in North America as well as in Europe, where it will go on sale in early 2011. Wayne Brannon, executive director of Chevrolet Europe, said: "With their fresh, clean approach, we believe Spark and Orlando will appeal to a wide range of customers who want fuel efficiency, functionality and great design combined with excellent value."